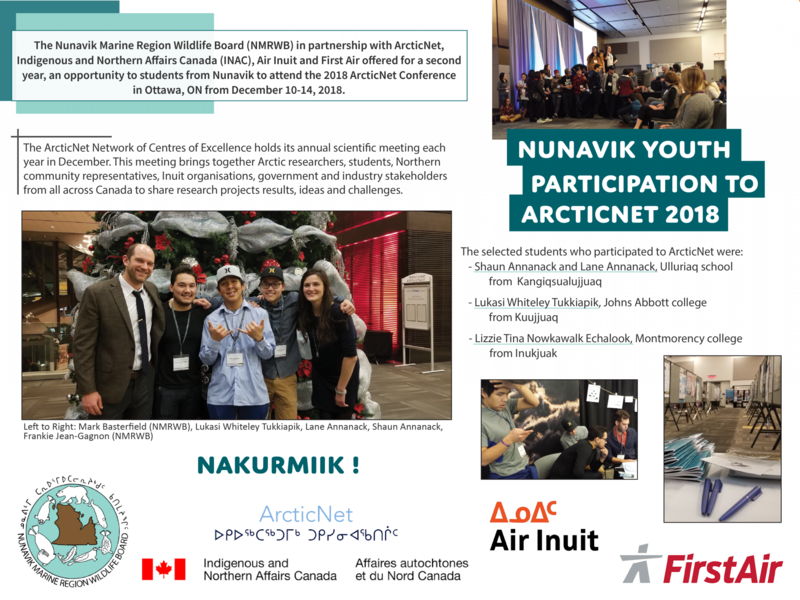 Students from Kangiqsualujjuaq, Kuujjuaq and Inukjuak attended the 14th ArcticNet Annual Scientific Meeting in Ottawa from Dec 10-14, 2018. The Nunavik Marine Region Wildlife Board as the main instrument of wildlife management in the Nunavik Marine Region and as the main regulator of access to wildlife has decided to establish a total allowable take (TAT) for beluga within the NMR in accordance with section 5.2.3 (a) and 5.2.10 of the NILCA. This decision is supported by ecological evidence from science, the knowledge of Nunavik Inuit, as well as social, cultural and economic factors, much of which is drawn from the NMRWB’s consultation with Nunavik communities and the Local Nunavimmi Umajulirijiit Katujjiqatigiinningit (LNUKs) .